So this weekend I was determined to put this right. We went across via Eurotunnel for three days and two nights and I dedicated our first morning to shopping in Calais. I should save a better description of what’s on offer there for the phantom French site however I thought readers here would be more interested in the contents of my shopping basket. I added to my collection of “Les 30 Recettes Culte” with these three volumes on yogurt, feta cheese and TWIX. “Mignardise Sucrees” roughly translated is sweet bitesize bakes i.e. the same name as my own book Sweet Bitesize Bakes so I couldn’t resist picking this up. I didn’t pick up many groceries since we were not self catering and I already have a guilty hoard of French jars in my kitchen. Packet macaron mix – I was intrigued to see how these came out. Sucre chouquettes – you see these on top of brioche but never for sale in the UK. Violet syrup – difficult to buy in the UK and expensive. This bottle was a bargain at £3. Blackcurrant coulis – I opted for blackcurrant since I can easily make raspberry coulis myself whereas blackcurrants are trickier to get hold of. Teisseiere strawberry syrup – Although this is one of my favourite summer French drinks to order in bars, I don’t tend to drink it at home. My husband snook this into the trolley. Funnily enough, although I’ve kept banging on about the French website, I actually started one of sorts before Maison Cupcake. And one of it’s only posts was about canned potato gratin. On that occasion it was from Lidl in the UK although sadly Lidl only stock it occasionally for French promotions rather than all the year round. So whenever I get opportunity I stock up on several cans of it in French supermarkets. It’s pre-cooked thin slices of potato in a garlicky creamy sauce and you simply bung it in an oven dish and bake for 25 minutes. If you’re coming back from France by car, do buy some. The cans are always 850g so rather heavy if you’re flying! Finally I grabbed some white crockery in various shapes. These items are all Carrefour’s own label range and similar prices to supermarket own brand crockery in the UK. I think you’ll agree they look more sophisticated though! The pots in the middle look like egg cups but they’re actually cylinders for desserts. I can’t wait to get photographing some creations in these. These items were by another brand called “Quid”. I especially like the rectangular plates since they’re shallow and won’t create shadows around food in photos. Finally I should ‘fess up that this wasn’t the end of it. On leaving France, we spent two days in Belgium where I discovered Bruges’ answer to Divertimenti, Dille & Kamille. It was THE best kitchen shop I’d ever been in in my entire life. My husband patiently sat outside for nearly an hour! I can’t show you what’s in the bag yet because I haven’t unwrapped it all. I think the lady must have thought I was crazy only buying one of everything. 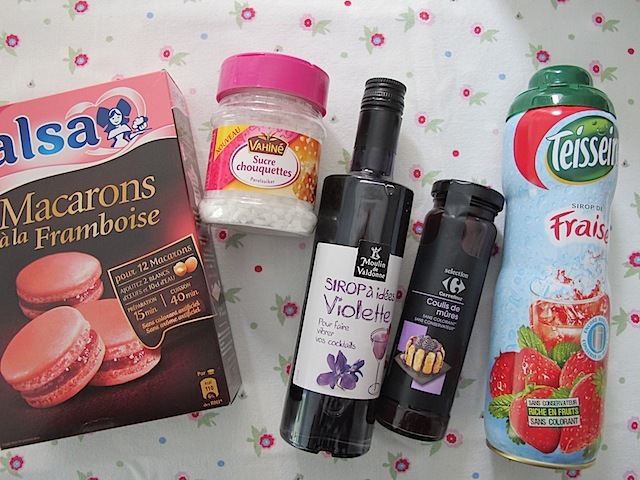 What do you like to buy in French supermarkets?